You are here: Home / Banksy / Mr. Brainwash Bombs L.A. The faded mocha edifice that until last year housed CBS’s Columbia Square studios looks at first glance completely abandoned. On giant placards that once displayed pristine, smiling headshots of the KCBS news team, the local newscasters now sport spray-painted Marilyn Monroe wigs, Warhol style. On another billboard, hand-scrawled letters spelling “Life Is Beautiful” drip as if they had been painted in fresh blood. Is it good old vandalism, or signs of life? Aficionados of Los Angeles street art might recognize the now-familiar work of one “Mr. Brainwash,” a.k.a. MBW, a.k.a. Thierry Guetta, a French filmmaker turned graffiti provocateur. 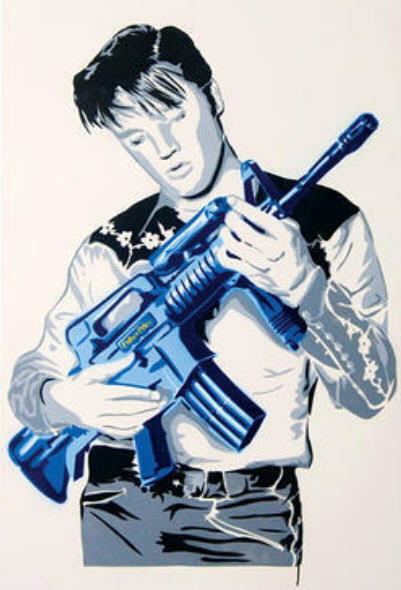 Over the past few months, Mr. Brainwash images have become ubiquitous in greater Hollywood, evolving from the Banksy-style black-and-white stencils of a guy wielding a movie camera to repurposed reproductions of Elvis, Hendrix, Gandhi and other cultural icons, including the giant spray-paint can rebranded, à la Andy, as Campbell’s Tomato Spray. These MBW specials are wheat-pasted up and down the La Brea corridor, the Miracle Mile, Melrose, Fairfax . . . anyplace with an unadorned utility box or blank wall. Now Guetta is about to unleash an art happening at Columbia Square so audacious in scale and ambition that it will either make him an instant art star or an object of derision, a high-profile lesson in the perils of the vanity DIY spectacle. Either way, the opening party is going to be fabulous. « American Held in Pakistan Shootings Worked With the C.I.A.